As big as the pile of paperwork on your desk might be, getting out of the building is an important part of any marketing strategy. Marketing is, after all, a discussion with your clients and potential clients about your business. It is not always possible to do that from behind your desk. What do I mean by getting out of the building? Where will you go? Well that very much depends on your community, your business, and your marketing strategy in general. The idea is to engage with your clients on their own turf – so were is that? If you are a veterinary practice, you might find that there are pet oriented events in your community on a regular basis. Can you go along to them? Can you have a little information booth? Can you sponsor the event? Once you start looking for events you’ll see them all over your community, and as long as you can come up with a connection to the event, the organizers will always be happy to have another booth. In retail and service industries, the businesses are often recognized just by their brick and mortar exteriors. Getting out into the wider community allows you to meet with your clients, and potential clients, on ‘neutral’ ground and for them to see the people who are in that building. It also proves your commitment to being more than just a business, but to actually being part of the wider community. In addition to events, become a good corporate citizen. Join the local Chamber of Commerce, or other similar organizations, and actually go to some of the networking events and meetings. Yes, it can sometimes seem like an ‘old boys club’ at organizations like the Chamber of Commerce, but go anyway. You’ll be surprised at the wide cross-section of your community who attend, you’ll find out a lot about what is going on in your town, and how that might affect your business. You’ll also make connections with local officials, the media, and other business that may become useful. If you are in a larger metropolitan area, there may even be industry specific groups, or groups that relate to your daily tasks (like marketing) you can join. It is easy to say “I’m too busy to go to that!” Make going to events just another part of your job – like doing payroll. You can’t say “I’m too busy to do payroll” – or at least I hope you don’t say that. Before embarking out in the big wide world do have, for want of a better expression, and elevator speech ready. An elevator speech is basically a distilled version of your marketing strategy, and branding efforts, that only takes up a couple of minutes to recite. Why should someone come to your business in other words. The the good ones don’t sound like that is what you are saying, but at the same time they hit all the salient points. If you are going out and doing events you probably need a little more than that – a reason, beyond just self-promotion, to be out in the wider community. Of course, if someone asks about your business, that is when your elevator speech comes into play. In the veterinary field, zooanosis awareness (the transmission of disease from pets to humans) or the importance of vaccination are great examples of public information subjects. Fire departments, often do outside events with excellent themes such as the importance of emergency plans or checking the batteries in smoke detectors. 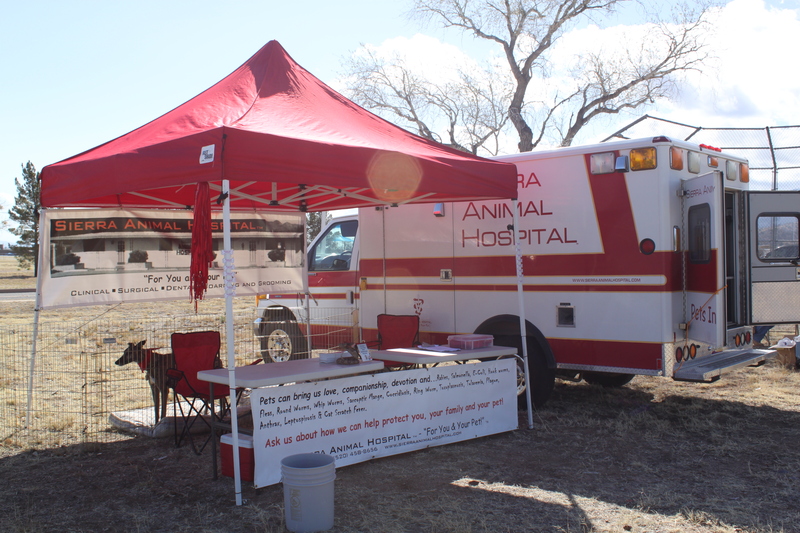 A booth for a vetererinary practice that includes a dog to pet, information about zooanosis and the promotion of a pet ambulance. Whatever you choose, don’t try to do too much. Have a theme and stick with it. It is also important that this theme resonate with your strategy in your business as a whole. There is not point, for example, in having staff promoting the importance of zooanosis awareness out in the field if you also do not promote that in the veterinary clinic itself. Social marketing and networking, which is effectively what this entire blog post has been about, is an excellent way connect with the community and promote your business without promoting your business. It can pay huge dividends in the long term, is inexpensive as long as you are sensible, but it is a long term strategy – don’t expect immediate returns. That way you’ll be pleasantly surprised when you get them!